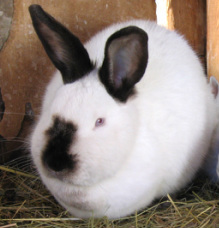 A "nestbox to table" workshop on the basics of raising meat rabbits. Due to its graphic nature, the butchering demonstration will be reserved for the last hour of this workshop. If you would like to attend for the information, but do not wish to observe the demonstration, there will be an opportunity for you to ask questions and leave prior to the demonstration. We will discuss the humane use of rabbits for meat, both for human consumption and as pet food. If this topic disturbs or offends you, please do not register for this workshop. Please also consider carefully whether this workshop and difficult subject matter is age appropriate for your child. A limited number of rabbits may be available for purchase at the end of the workshop. Available breeds will vary, and may include meat breeds as well as smaller, pet breeds. Prices for these rabbits will depend on what is available the day of the workshop. If you are interested in purchasing a rabbit, please bring your own pet carrier. Click here to print your registration form and liability release. Link temporarily disabled since new dates have not yet been scheduled. A separate liability release is required for each person that plans to attend with you. In the event that weather conditions require the workshop to be postponed, the workshop will be rescheduled for the rain date listed at the top of this page. No refunds will be given unless the workshop is cancelled due to circumstances beyond our control.